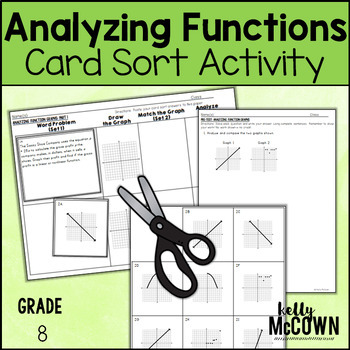 One skill that students need to master in eighth grade is functions. In sixth and seventh grade students lay the foundations for equations and functions. Now that they are in eighth grade they are using the equation skills from sixth and seventh grade. Students often make mistakes with setting up the function table, making connections between the function table and graph or function table and equation. These are simple mistakes that you can prevent with practice. 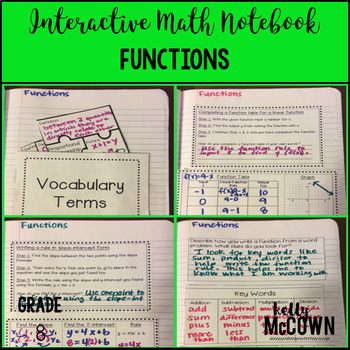 I have listed here activities to review and practice Functions. I hope these help jump start your lesson planning. The key to getting your students involved in the learning process is to include interactive, visual, engaging activities for them to actively participate in. This math station activity is intended to help students understand how to graph proportional relationships, understand that a function is a rule that assigns one input to one output exactly, compare properties of two functions, interpret the equation y = mx + b, construct a function, determine the rate of change of a function, and describe the functional relationship between two quantities. These interactive notebook activities are intended to help students understand how to graph proportional relationships, understand that a function is a rule that assigns one input to one output exactly, compare properties of two functions, interpret the equation y = mx + b, construct a function, determine the rate of change of a function, and describe the functional relationship between two quantities. -Activities include: Vocabulary, Completing a function table and graph from a linear function rule, Writing a rule from two points using slope-intercept form, and Writing a rule, completing a function table, and drawing a graph from a function word problem. This lesson unit is intended to help you assess how well students are able to assess and graph functions in tables, graphs, and equations. This lesson unit is intended to help you assess how well students are able to describe qualitatively the functional relationship between two quantities by analyzing a graph (e.g., where the function is increasing or decreasing, linear or nonlinear). Sketch a graph that exhibits the qualitative features of a function that has been described verbally. 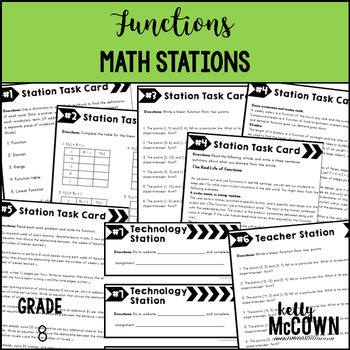 I hope these resources are helpful in getting your students engaged in Functions. Keeping students actively engaged in the learning process will ensure that they are in charge of their own learning. The goal of learning Functions is to set up the foundations for Algebra skills in the future. Students must master functions in eighth grade to be able to achieve success in Algebra. Your teaching is important and the students need to actively be engaged in the process.